Multiple platform website with a reservation and booking sytem. 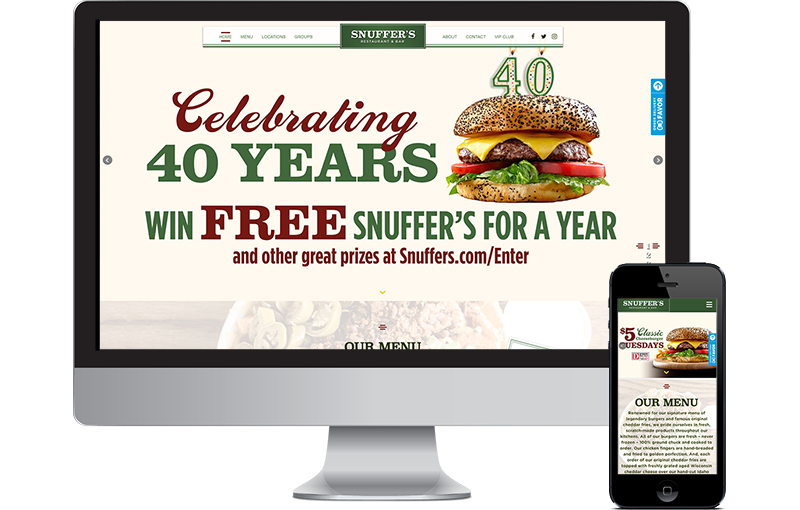 Snuffer’s Restaurant and Bar has been serving DFW’s best burgers and Cheddar Fries for over 40 years. They had a nice web design but it was built on the Old State CMS platform Governor and the client wished to move to WordPress. We rebuilt this restaurant website from the ground up in Photoshop to mimic the original Old State design. Then our team of expert CSS and WordPress ninjas transformed the drawing into a brand new website built on WordPress – the most ubiquitous CMS platform on the planet. Snuffer’s is now using some cool technology that we built in house for our other restaurant clients. Our easy to manage custom food menu plugin, our restaurant locator plugin and custom API integrations to Fishbowl and Tripleseat make the Snuffer’s website more efficient and offers a better user experience. We hope you enjoy their new site as much as we enjoy their Cheddar Fries.